I've read the book and also enjoyed it, plan to post my own review at some point. 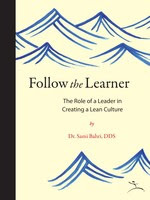 I love how Sami tells his own personal journey... not "implementing lean" per se, but solving problems and making things better. I've seen his office and it's all real.